Our Adjustable Height Ultrasound Medical Cart shelves are 1” thick and wrapped in a highly durable thermoplastic laminate that resists cracking and peeling and stands up to a wide range of chemicals. Heavy cast metal base keeps the cart very stable on its compact 17” wide x 17” deep footprint. The base holds four 4” diameter twin wheel casters (two locking) for easy maneuverability. Supports 150 lbs. overall, up to 50 lbs. on the top shelf. The column is balanced to lift 16-30 lbs. Lifetime Warranty against manufacturing defects, five year warranty on the cylinder. Made in the USA. 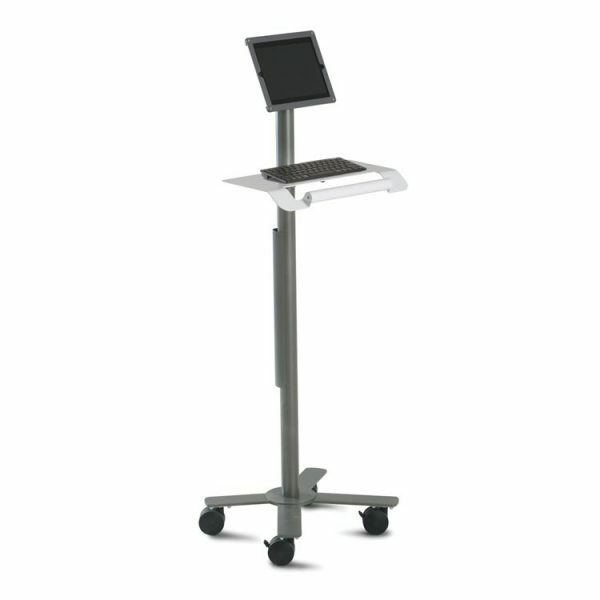 Package includes 22” wide Adjustable Height Medical Cart with Lipped Shelf, Handle, Large Probe Holder, and Metal bin. Carry all your supplies on a compact, easy to steer cart that takes everything you need right to your patient. Squeeze the paddle to easily adjust the cart height 30”- 40” so it’s comfortable. Use the built-in storage for gloves, gel, and more. The Ultrasound Cart features a cap shelf with a 1/2” high lip. The lip extends around the entire top to keep items from rolling off. With a long list of options, you design your Ultrasound Cart around your equipment so it fits like a glove. 22″ w x 21″ d x 30″ – 40″ h Weight: 67 lbs. Adjustable Height Phlebotomy Medical Cart Shelves are 1” thick and wrapped in a highly durable thermoplastic laminate that resists cracking and peeling and stands up to a wide range of chemicals. Heavy cast metal base keeps the cart very stable on its compact 17” wide x 17” deep footprint. The base holds four 4” diameter twin wheel casters (two locking) for easy maneuverability. Supports 150 lbs. overall, up to 50 lbs. on the top shelf. The column is balanced to lift 16-30 lbs. Lifetime Warranty against manufacturing defects, five year warranty on the cylinder. Made in the USA. 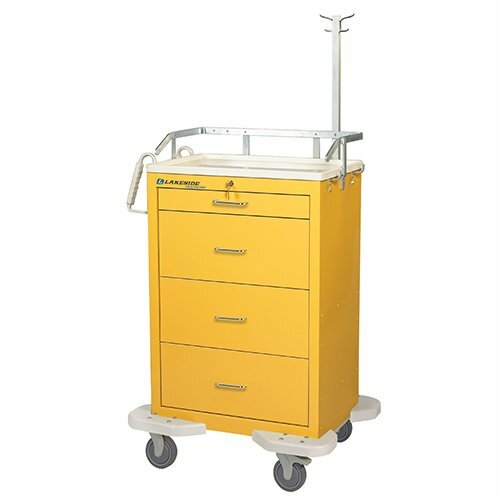 Our 4 Drawer Medication Carts are driven by evidence based design, perfect for any healthcare or medical facility. Quiet mobility is accomplished using full extension, ball bearing drawer glides and 5″ diameter sealed bearing, non-marring casters. Constructed of heavy duty gauge steel, these carts are finished in all Traffic White, Gray/Yellow, Gray/Red or Gray/Blue PowderCoat colors that will fit into any decor. Our Media & Utility Wire Carts are GreenGuard Gold certified and are available in 7 different sizes. 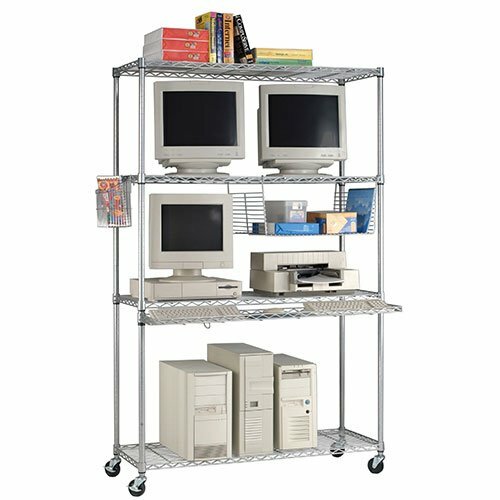 The carts come with sturdy 5″ locking casters and chrome finish shelves & frame. 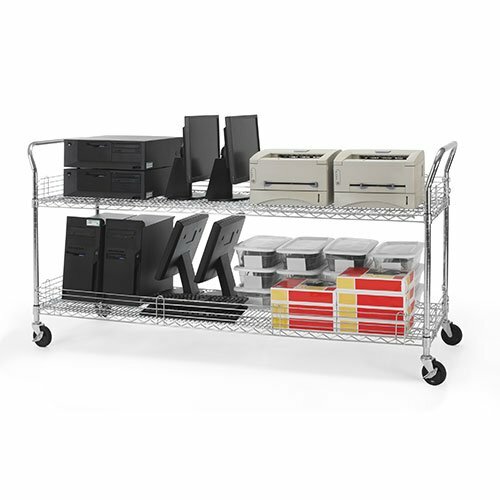 Durable and adjustable, these carts are the perfect solution for your Classroom or Educational facility. Email Bakagain for more information. We are happy to assist you with specific selections and questions you may have regarding your Education Wire Carts needs. Our Adjustable Height EKG Medical Cart shelves are 1” thick and wrapped in a highly durable thermoplastic laminate that resists cracking and peeling and stands up to a wide range of chemicals. Heavy cast metal base keeps the cart very stable on its compact 17” wide x 17” deep footprint. The base holds four 4” diameter twin wheel casters (two locking) for easy maneuverability. Supports 150 lbs. overall, up to 50 lbs. on the top shelf. The column is balanced to lift 16-30 lbs. Lifetime Warranty against manufacturing defects, five year warranty on the cylinder. Made in the USA. 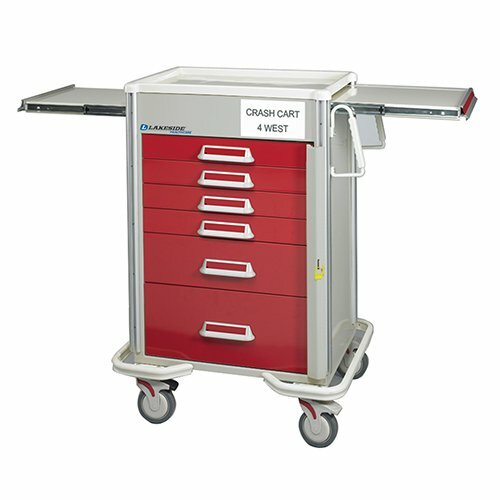 Our 6 Drawer Emergency Cart is driven by evidence based design, perfect for any healthcare or medical facility. Quiet mobility is accomplished using full extension, ball bearing drawer glides and 5″ diameter sealed bearing, non-marring casters. Constructed of heavy duty gauge steel, these carts are finished in Gray/Yellow, Gray/Red or Gray/Blue PowderCoat colors that will fit into any decor. This 40” high POC Computer Cart has a 26” high extension for display. Display installs at any height; tilt for comfortable view. Strap secures computer to its shelf. Rear-mounted bin holds cables. Holds 150 lbs. Lifetime Warranty. Made in USA. When we say small, we mean dinky! Our Mobile Tablet Stand for Tablets is only 18”w x 16.5”d and weighs just 27 lbs, perfect for holding your light device without the fuss of an overblown iPad or tablet floor stand. You’ll love the 3 tablet mount options and comfy 40” standing height shelf, too! More details below. Our Lan Station Carts are GreenGuard Gold certified and can be used as freestanding units or made mobile with the included 3″ casters. Durable and adjustable, these units are the perfect solution for your learning facility. We are happy to assist you with specific selections and questions you may have regarding your Educational Wire Shelving needs, designers on staff. When we say small, we mean dinky! 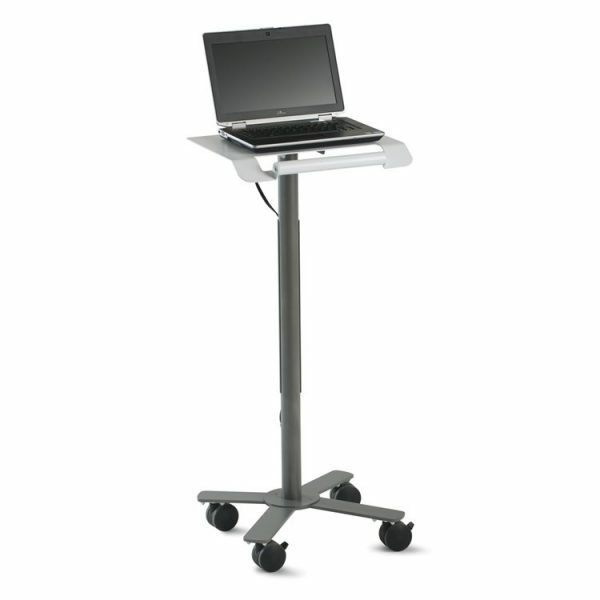 Our Mobile Laptop Computer Stand is extra nimble at only 18”w x 16.5”d and weighs just 24 lbs, perfect for holding your light device without the fuss of an overblown laptop stand. You’ll love the comfy 40” standing height work surface, too. More details below. 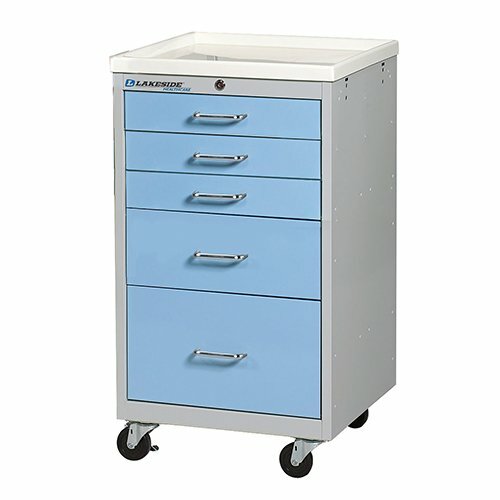 Our 5 Drawer Mini Medical Carts are driven by evidence based design, perfect for any healthcare or medical facility. Quiet mobility is accomplished using full extension, ball bearing drawer glides and 4″ diameter sealed bearing, non-marring casters. Constructed of heavy duty gauge steel, these carts are finished in Gray/Yellow, Gray/Red or Gray/Blue PowderCoat colors that will fit into any decor.